Description: Unconventional design, unmatched performance, and familiar AR handling. The SIG MPX redefines the submachine gun category with a level of operator safety, in-field adaptability and proven reliability in the harshest environments. Completely ambidextrous, the SIG MPX is great for left- or right-handed shooters with its dual-sided selector switch, magazine release, charging handle and bolt release. The SIG MPX operates from a fully-closed and locked rotating bolt, offering enhanced reliability and safety in use. A short-stroke gas piston allows the SIG MPX to run all weights and brands of 9mm ammunition with no adjustments to the gas valve. A full-length picatinny rail allows for solid, consistent mounting of optics and targeting lasers. 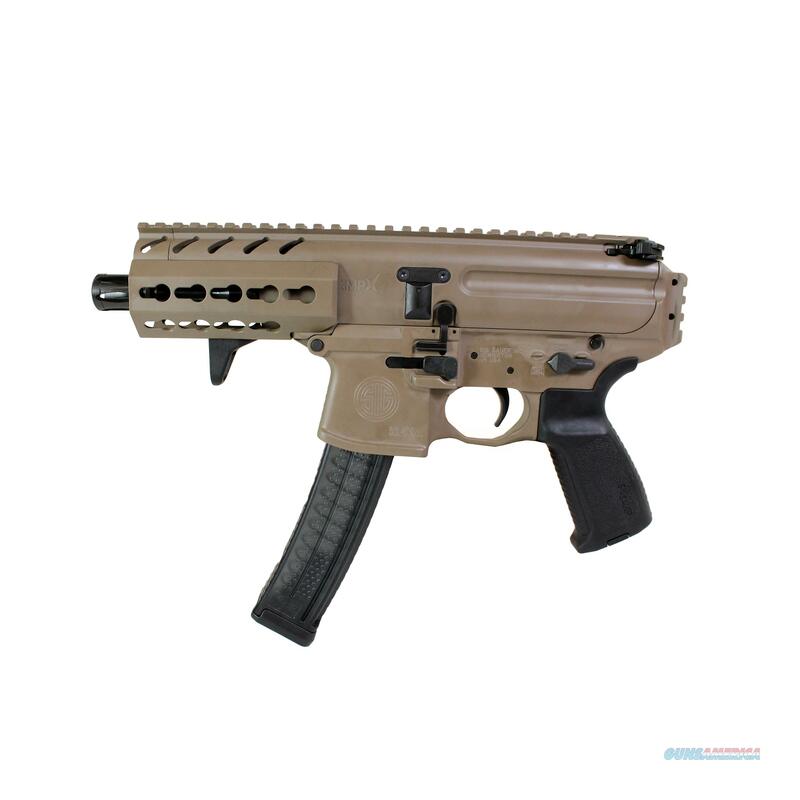 The MPX K features a 4.5" barrel and a short aluminum KeyMod handguard with handstop.Features:- User Changeable Barrels- Short Aluminum Handguard with Handstop- Ambidextrous AR-style Controls Specifications: - Operating System: Gas Piston- Caliber: 9mm Luger- Mag Type: MPX- Finish: Flat Dark Earth- Barrel Length: 4.5"- Mags Included: (2) 30 Round Polymer Mag - Action Type: Semi-Auto - Barrel Material: Carbon Steel- Trigger Type: MIL-SPEC- Trigger Weight: 5.5-9.0 lb (24-40 N)- Twist Rate: 1:10- Forend Type: Alloy- Grip Type: Polymer- Receiver Finish: Flat Dark Earth- Overall Length: 13.5"- Overall Width: 2.4"- Height: 4.6"- Threads: M13.5 x 1 mm- Accessory Rail: KeyMod- Weight: 4.6 lbs.